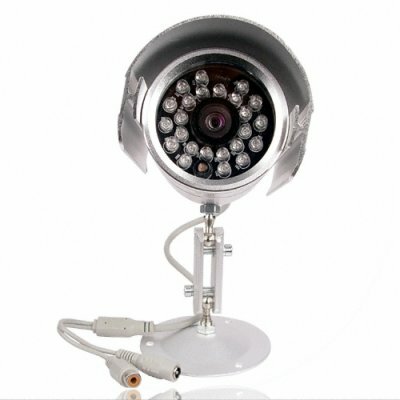 Successfully Added Wired Night Vision Color CCD Camera -PAL to your Shopping Cart. Keep your loved ones safe with this 420 line CCD camera. This wired CCD camera has a high resell value and host of other feature such as; automatic white balance, back lighting compensation and a weatherproof casing. Order your sample securely in our online store and enjoy the benefits of direct-shipping and no M.O.Q. (no minimum order quantity). NTSC is available if ordering more than 25 pieces - please contact customer support to request an NTSC version. Excellent, good medium quality camera, works well straight out of the box. Only quirk is that it has phono connectors for the video feed rather than BNC. Product arrived well boxed, in good condition, and excellent delivery time. Will definitely buy more. This has 24 LEDs for night vision.